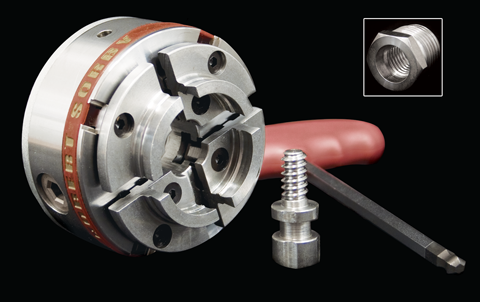 The Patriot is a precision 4-Jaw self-centering scroll chuck made in England by Robert Sorby. The chuck uses a single tilt-away wrench that allows even larger workpieces to be tightened easily. The design of the gearing insures smooth jaw travel for the life of the chuck. A wide range of optional jaws are available. The Patriot Chuck comes standard with a screw center that permits mounting a workpiece easily with an 11/32” diameter pilot hole. The body of the 33mm Patriot Chuck is threaded directly to fit a 33mm x 3.5 lathe spindle only. This version of the chuck does not use an insert, unlike both the Standard Patriot Chuck and the Compatriot Chuck.